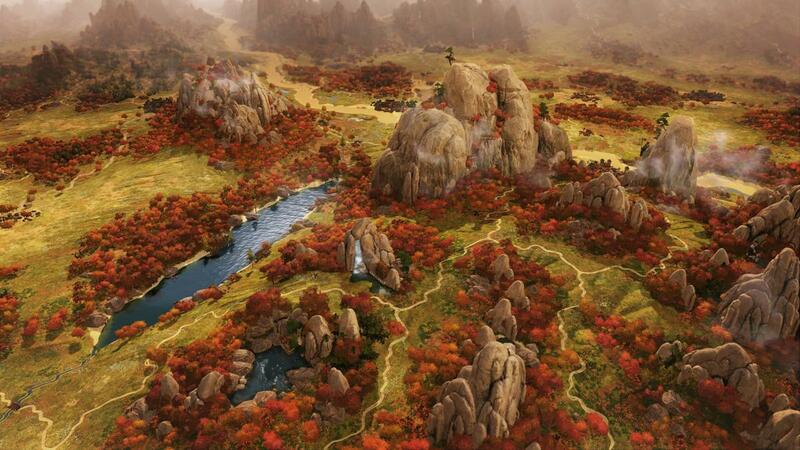 Few previews feel so fraught with danger as Total War. It’s a series with some very high highs, including the original Rome, Medieval II, Shogun II, and (more recently) the Warhammer games. Then there are the disappointments, including the infamous Rome II and last year’s Thrones of Britannia. And I bring up Warhammer and Thrones of Britannia to show how hard the pendulum can swing. 2017 brought one of the best Total War games, 2018 one of the worst. Worse, these are games that take upwards of 20 or 30 hours to play a single campaign, and it’s often hard to tell whether it’s worth the time investment until you’re most of the way through. Strategy games are difficult to read, that way. A developer can tell you how systems ideally work, tell you the underlying numbers, tell you the unit names and the theme and the goal, but there’s an ephemeral quality that’s hard to pin down, a cohesion that a game either finds or fumbles. Take this preview with a grain of salt, in other words. I recently had the opportunity to go hands-on with Total War: Three Kingdoms for upwards of two hours, which sounds like a lot of time. In reality though? That covered maybe 25 turns—hardly enough to get a solid impression. There are some interesting aspects to dig into though. 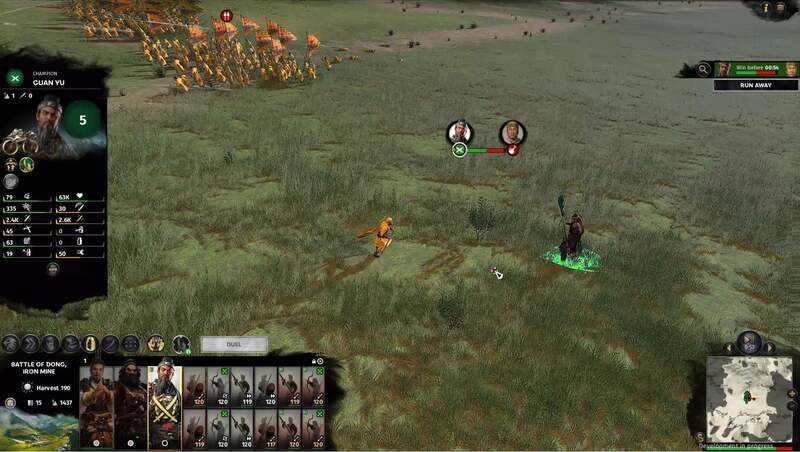 Total War: Three Kingdoms is an interesting challenge for the nearly 20-year-old Total War series. The two Warhammer entries have proven, I think, more popular and successful than anyone could’ve imagined. And that’s great, except they also upended most of the Total War formula. Freed from the confines of actual human history, the Warhammer games were able to create livelier and more iconic battles, a better narrative framework for your actions, unique win conditions and tech tree unlocks—all sorts of ideas that were (for the most part) new to the series. The question: What happens when you’re once again constrained by human history? To that, Creative Assembly came up with a pretty interesting answer. Three Kingdoms takes as inspiration the fall of China’s Han dynasty and the ensuing civil war, a.k.a. the Three Kingdoms period. It’s a real-life historical era, the stock-and-trade of Creative Assembly pre-Warhammer. You’re perhaps more likely to know it from Romance of the Three Kingdoms though, a loosely historical novel written more than a millennia after the actual events, and which forms the basis for many Three Kingdoms-set adaptations (including the Dynasty Warriors series). Romance draws on historical records, but injects the story with some larger-than-life actions on the parts of its characters. This duality is the basis of Total War: Three Kingdoms. There’s a classic Total War experience for those who want it. But the new default is “Romance” mode, which folds in some of the changes from the Warhammer games—namely, those larger-than-life characters. For our demo we played as Liu Bei, the “Virtuous Idealist,” who hopes to restore the proper Han dynasty to power and unite China. 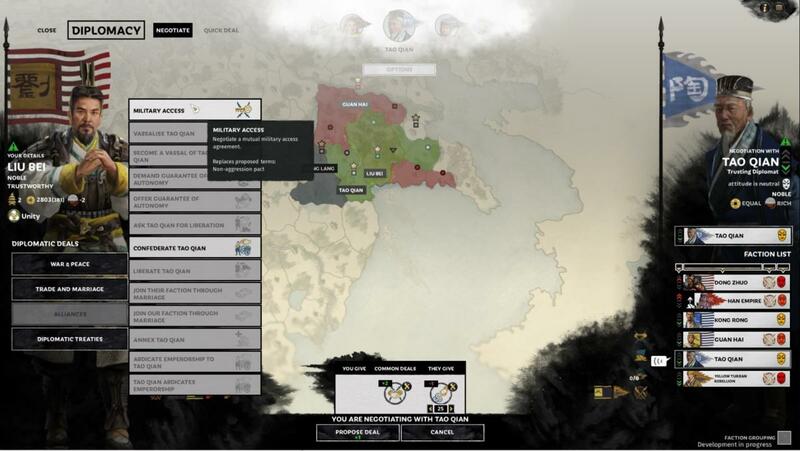 Problem is, Liu Bei starts the game with a small army and no territory at all. No cities, no way to resupply his troops, nothing. So the first order of business is capturing a city or five. My enemies at this point were primarily Yellow Turbans, the remnants of a peasant uprising. And the battles you fight carry about as much prestige as you’d expect, putting down a rebellion. The first fight of Liu Bei’s campaign is over...an iron mine. That’s it! It’s hardly an auspicious start to your career. 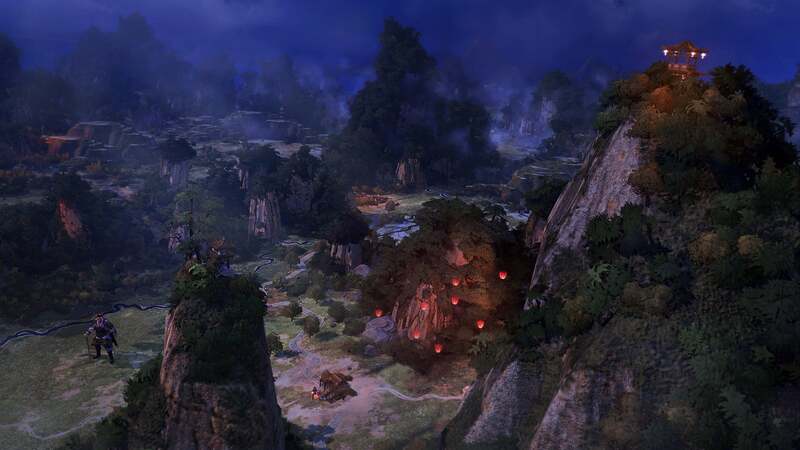 It did showcase Three Kingdoms’ new character heroics though. Mere seconds into the conflict, the opposing commander Zhao Bo proposed a one-on-one duel with my general Guan Yu. An area cleared in the middle of the battlefield, the two sparring as their armies fought around them. It doesn’t have quite the same visual impact as a dragon knocking aside Warhammer grunts, but it’s still a uniquely cinematic moment for the heretofore ultra-serious Total War series. Your various named generals are now essentially “Hero Units,” with unique armor, weapons, and skill trees. I’ve seen no evidence of the unique story-driven battles I loved in the Warhammer games, but I wouldn’t be surprised if they’re in here as well. I just don’t know one way or the other. Regardless, it’s a more character-driven game than any Total War since probably the original Rome, and that’s a good thing in my book. Generals can be appointed to government positions, a throwback to the dynasty systems people liked in previous Total War games. They can also develop rivalries, or even get so jealous they choose to leave for a different faction and take their army along with them. Each general has a focus as well, based on elemental traits. A “Fire” general, for instance, is colored red and has bonuses related to cavalry, while the blue “Water” general is better at leading ranged units. At its heart this is just an extension of the rock-paper-scissors algorithm underpinning Total War’s mechanics, but it makes for interesting strategic decisions. Do you add another rank of spearmen because you’ll get an accompanying bonus to their skills, or do you take the cavalry you know you need even if you’re less attuned to using them? And will archers finally be less overpowered? Time will tell. Anyway, we didn’t get too deep into the character system. As I said, 25 turns isn’t much at all—certainly not long enough for someone to betray Liu Bei and jump to an opposing faction. There were a few other changes though, some I’m really keen to see in the final release. Total War’s finally (finally!) overhauled its diplomacy system. Diplomacy’s a weak point in pretty much any you-versus-AI strategy game, but it’s been particularly bad in Total War for a while. You were limited to a small handful of options, many of them near-useless, and the AI was unpredictable at the best of times. Wars were all-too-often endless affairs, no amount of bargaining enough to secure peace, and peacetime diplomacy options were nil. Three Kingdoms gets a hell of a lot more complicated, in a good way. There are the usual options—war, peace, alliances, et cetera. But there are also nuanced options like “Request permission to declare war” from an ally, or “Support independence” of vassal states, or “Arrange marriage.” Someone’s been playing a lot of Paradox games, I think. The one that surprised me most: In Romance of the Three Kingdoms the governor of Xu Province, Tao Qian, falls ill and offers the governorship to Liu Bei from his deathbed. The new diplomacy system is sophisticated enough to reproduce this event in-game, with Tao Qian an early ally of Liu Bei and then, a mere 10 or 15 turns in, handing over his entire territory before passing away. 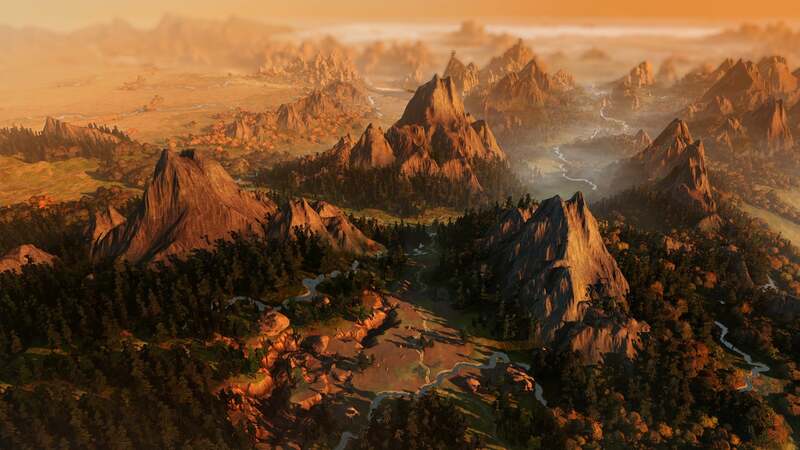 It’s a really unique moment, one that speaks to the same level of fastidious care in Three Kingdoms that we saw in Warhammer—and one that opens up a world of possibilities for recreating (or diverging from) other important historical moments. I’m excited to see whether the new system actually pans out, or whether the AI is as dumb as ever, but that’s something we won’t know until we’ve played a full campaign or two. There’s also a cool new end-game scenario where up to three factions declare themselves emperor, and then fight it out among themselves. We obviously didn’t see any of that in play, but it sounds neat. It’s not as unique as Warhammer’s bespoke end-game conditions, but should hopefully be more interesting than the never-ending conquest slog from previous historical Total Wars. My only real complaints at this point—again, a mere 25 turns in—concern some of the artistic choices. The game looks phenomenal, as you’d expect. There are some weird choices though. Cities and armies tend to blend into the landscape, with the accompanying info panels (like city names) even occluded by objects on the map, i.e. mountains, clouds, et cetera. It’s hard sometimes to take a glance and get an idea what’s happening, which is annoying when information is so vital to your actions. The city screens are also a mess, once again. 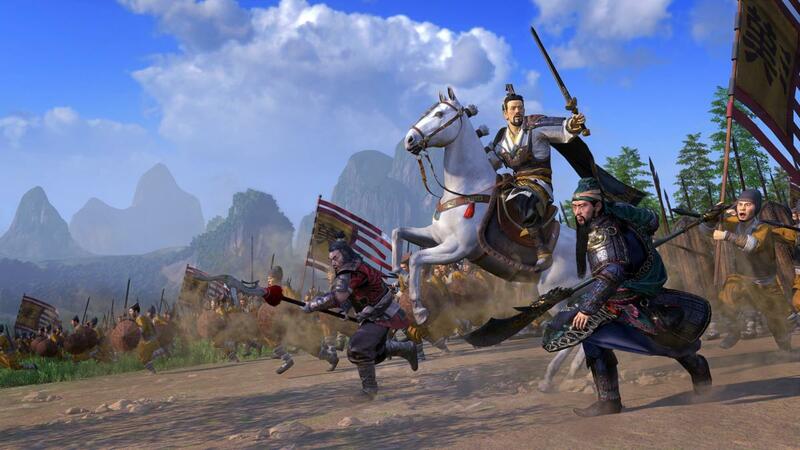 It’s not quite as bad as Rome II, but the issues in Three Kingdoms stem from similar roots. I was constantly struggling to figure out what I could build, what I was already building, why I couldn’t access certain options, and so on. It’s something that 30 hours hands-on might rectify, but there’s a line where form-over-function becomes annoying, and Total War keeps crossing that line. That said, I love the tech tree. 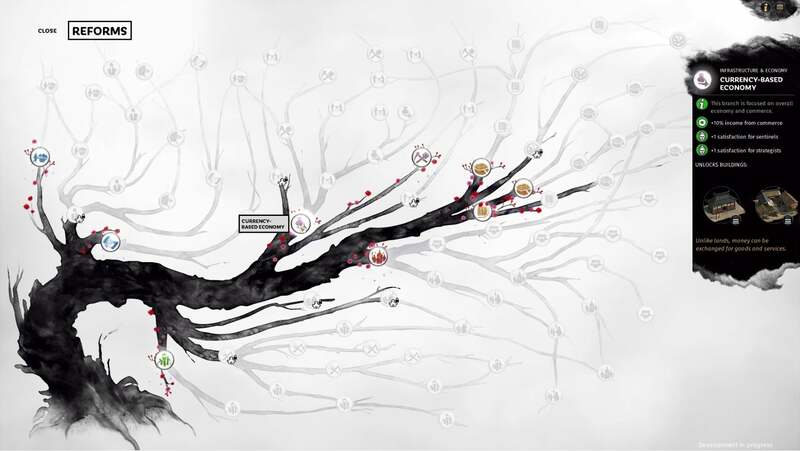 It’s styled after a literal tree, sprouting cherry blossoms on the branches you choose, and is quite literally the most beautiful interface I’ve ever seen in a game. So yeah, form-over-function doesn’t always work, but when it does it can be stunning. Who knows, though? Total War: Three Kingdoms seems pretty damn good from what I’ve played, but Creative Assembly’s track record is too spotty of late for me to readily recommend it sans-review. There are bold changes at play here, and many of them are necessary changes, but it remains to be seen whether it’s a triumphant reinvention of the series or just the first stumbling steps towards a better future. Total War: Three Kingdoms is due to release on March 7, 2019—the first proper historical Total War since Attila in 2015, or even 2013’s Rome II if you count Attila as a spin-off. That’s quite a long time, indeed. I hope it’s been worth the wait.